On Monday, only eight people showed up to a pro-immigration reform event held by Organizing for Action (OFA), the policy advocacy group that was formerly known as the 2012 Obama reelection campaign. 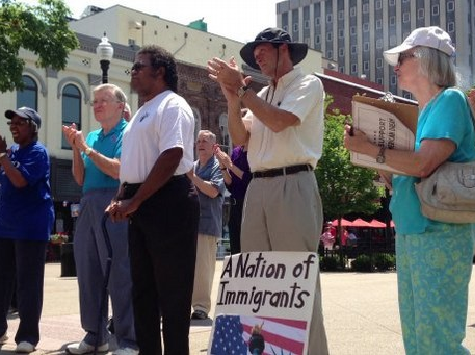 According to a Huffington Post report, the group could only entice “eight people to rally outside of the Merillville office of Rep. Pete Visclosky (D-ID) on Monday to push the congressman to support reform.” The Indiana Democrat has opposed a “pathway to citizenship” in the past. Yet the group still seems unable to motivate voters in the heartland and blue-collar areas enthusiastically to support comprehensive immigration reform. The Senate passed immigration reform last week 68-32, and the House is drafting its own immigration reform legislation.